You can purchase a pint of your favorite beer at almost any restaurant, pub or bar. With 16 ounces of beer, a pint has one-third more beer than a typical 12-ounce bottle and, of course, about one-third more calories as well. An average pint of regular beer has 204 calories, according to the United States Department of Agriculture. If you prefer light beer, a pint of light beer averages 137 calories. Beer has no fat, regular or light, and has no calories from fat. Each gram of carbohydrates has 4 calories, per MedlinePlus, a service of the National Institutes of Health. A pint of regular beer has almost 17 grams of carbs, giving it more than 67 calories from carbohydrates. Each pint of light beer has just under 8 grams of carbohydrates for almost 31 calories from carbs. A single gram of protein also has 4 calories. 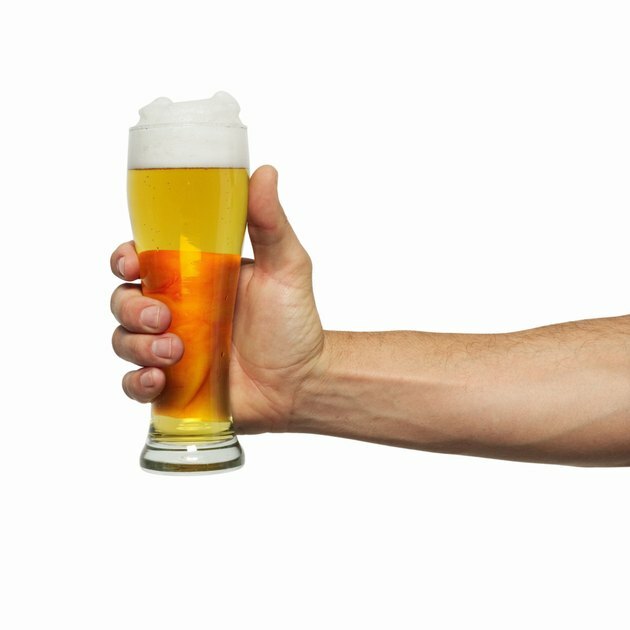 One pint of regular beer has more than 2 grams of protein for almost 9 calories from protein. With just over 1 gram of protein, light beer has nearly 5 calories from protein in each pint.